Announcing the winners of the 24th ever Right Place Photo Caption Contest! Presenting the top twenty captions for this picture from Stefan Zaklin/Pool/Reuters via Yahoo! #20: "...They would only give me Dasani, no Evian. I tell you, it is sheer torture to drink that stuff!" #19: Before his overthrow, Saddam was one of the two world leaders who could simultaneously belch and sign the alphabet, the other being Gerhard Schroeder. #18: "Excuse me, Your Honor, did you just say, 'I sentence you to death'? Ramsey, come over here a second, will you? A little closer, if you don't mind." #17: "So, I call Kofi on the phone and say, 'Hey! I send you UN boys bags an' bags of money and all I get for Christmas is this cheap suit?'" #16: "Hello, my name is Inigo Montoya. You killed my father: prepare to die." #15: "Hey, you want to talk torture? Just look at this suit they gave me to wear for court appearances! Right off the rack at J.C. Penney's: polyester/wool blend, stingy lapels, and three - count 'em, THREE - buttons on the cuff!" #14: "Have you got some Maalox? Those Fritos I had before the trial gave me indigestion!" #13: "I've been to Hell and back! Only two rations of Doritos a day, and then they send me into court without a necktie? Animals!" #12: "C'mere, c'mere, c'mere!!! Ya wanna see torture? Look at this suit! It's missing a button!" #11: "Who wants to be the lucky one I wipe this presidential booger on?" #10: "I'm telling you, by Allah, this is what they used to check my prostate!" 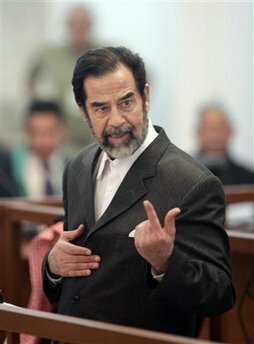 #9: Saddam tries to impress the court with his wicked air guitar technique. #8: "I am NOT delusional... I AM the President of Iraq! If you don't believe me, I will take this gun and blow your friggin' head off!" #7: "So... take me back to this s'posed 'spider hole'. If Saddam don't fit, you must acquit!" #6: "They say that the man who represents himself has a fool for a client. Gentlemen, I AM THAT FOOL!" #5: "I couldn't have ever pushed the nuclear button. My finger only goes UP. Just ask my cellmate, Mahmoud." #4: "I could not possibly have been executing my own people; I was too busy hiding my weapons of mass... Oh, crap!" #3: "As my friends Harry Reid, Ted Kennedy, John Kerry and Howard Dean stated so well..."
#2: "Don't you understand? I'm just a puppet! The REAL mastermind behind my presidency was that man in the balcony... Kahlil Rove!" #1: "Hey! How come I don't get to have a purple finger?"